All district schools will dismiss 15 minutes early on Friday, November 3 for a state-mandated Emergency Go Home Drill. This drill must be completed at least once each school year, and it must not occur more than 15 minutes prior to the normal student dismissal time. This drill is designed so that our district can practice our procedure for transporting students home in the event that inclement weather or a similar disaster affects our schools. All students will be dismissed to the location parents have indicated on the Student Verification Form in case of an emergency closing. Please be sure that any changes to your child’s emergency drop off location are made by November 1. Emergency dismissal locations for elementary school students must be within the attendance zone of the school they attend or to an approved/licensed daycare. 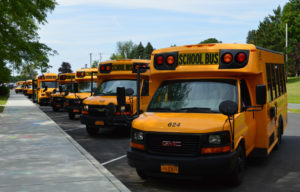 In the event that you need to contact the schools after the dismissal time, please call (518) 477-9288. You will reach the Transportation Department that will be acting as the emergency command post that would be activated if a real disaster occurred. In the event of a real emergency, parents would be notified through our SchoolMessenger notification system (phone/text/email) and messages would be posted on the district website and social media channels. This emergency drill, along with fire, lockdown, lockout and bus safety drills, are part of a continued effort to keep our students and staff safe. If you have any questions about this drill, please contact your school’s principal.